When I visited Port Jervis, New York, a year ago, the old signals from the days of the Erie Railroad still protected the siding leading into town, but replacement signals were standing. A year later, and somehow the Erie signals were still surviving. I made it my mission to capture a photo I didn't get around to doing a year ago. First some background. The line to Port Jervis is the old Erie Railroad mainline between New York and Chicago. In the merger with the Delaware, Lackawanna & Western in the early 1960s the Erie was somewhat chopped up as the new Erie Lackawanna shed redundant trackage. The line took a severe downturn in 1981 when the EL was merged into Conrail. Today the eastern end of the Erie between Hoboken, N.J., and Binghamton, N.Y., sees commuter trains from Hoboken to Port Jervis. Freight service through Port Jervis is down to one trackage rights train from the New York, Susquehanna & Western, which traverses the line westbound on Monday, Wednesday, and Friday nights, and eastbound on Tuesday, Thursday, and Sunday nights (although the westbounds usually get to Port Jervis after midnight). 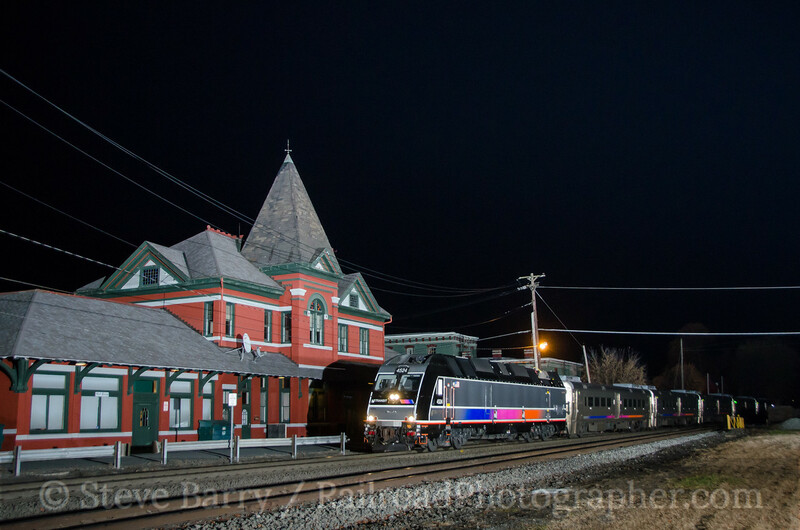 The shot I wanted was a Susquehanna train passing the Erie signals. My first attempt was on October 21, trying to take advantage of the fall foliage. The commuter trains are a joint operation between New Jersey Transit and Metro North Railroad, since the first half the of the journey is primarily in New Jersey (from Hoboken to Suffern, N.Y.) while the second half is entirely in New York to Port Jervis. Because of the joint nature of the operation, motive power from both railroads can be seen. 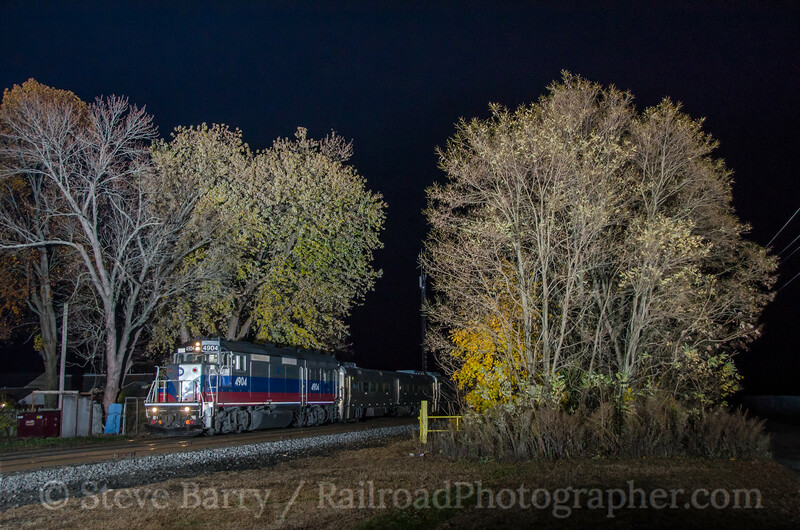 I shot the 9:27 train that departs east on this evening (above) with the trees showing just a brief bit of color, even this late in the season. The train was pushed by NJT ALP45-DP No. 4527, a dual mode locomotive that can operate as a diesel, but can also operate as an electric from overhead wires where they are present. Alas, for some reason my camera lost its focus, so when Susquehanna showed up at 12:03 a.m., the shot was fuzzy and useless. The second attempt came on November 4. 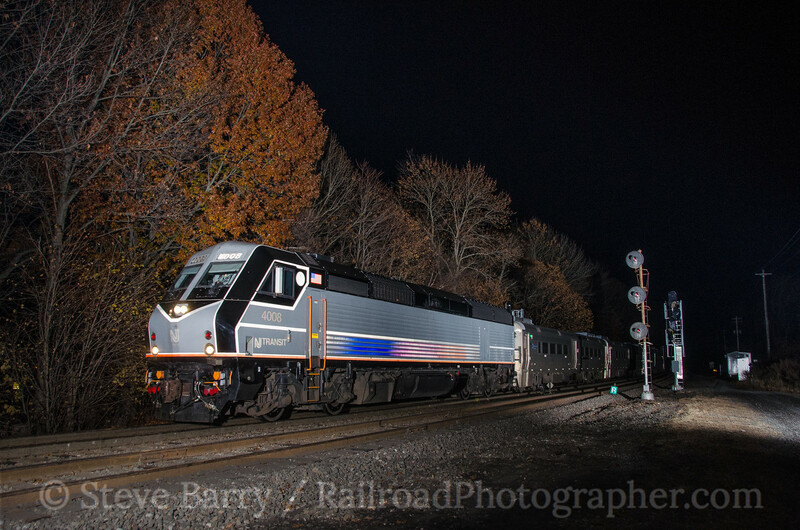 I got to Port Jervis early to shoot the semi-frequent commuter trains that come in. Expecting Susquehanna after 10:00 sometime, I had some time to try different angles with the commuter trains before moving to the Erie signals. ALP45-DP No. 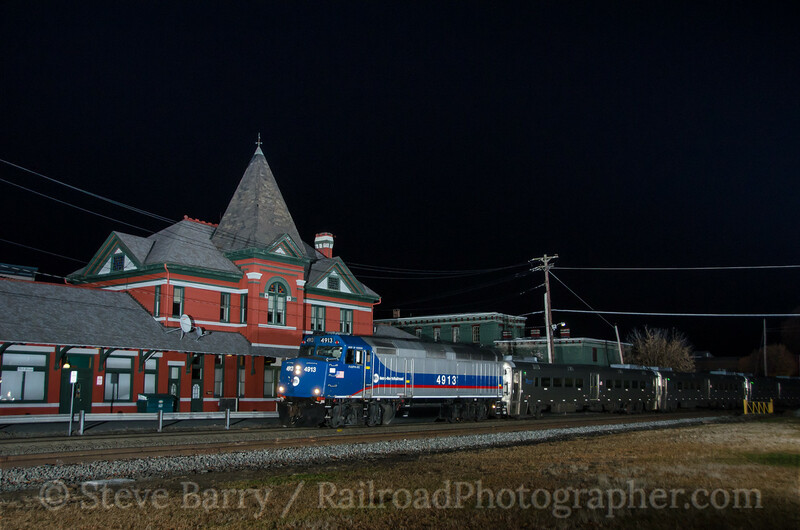 4524 led a train past the old Erie depot in town (the commuter trains stop at a plexi-glass shelter just west of the old station). 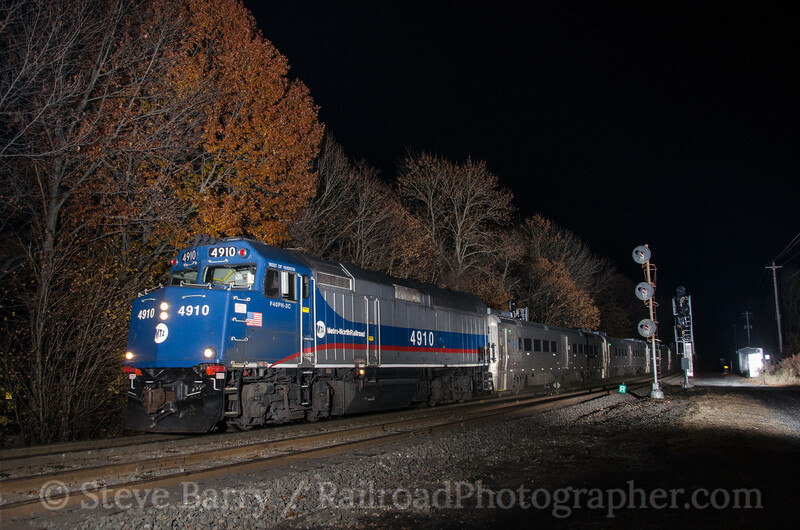 The next arriving train had one of Metro North's spiffy F40 locomotives leading. With the station shot in the bag, I moved on to what appeared to be some trees with color still in them just east of the station. Sadly, it looked better in the dark than it did illuminated by flash. Metro North GP40FH-2 No. 4904 led a train into town. Moving up to the signals, the trees were nice and colorful. 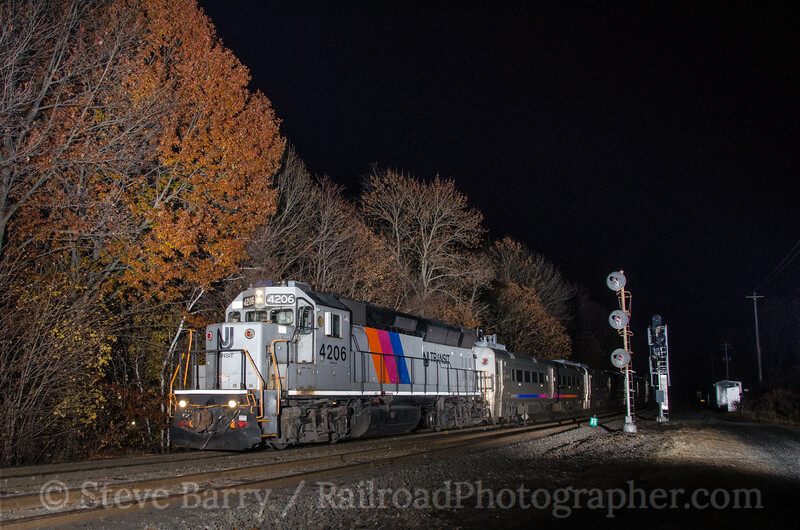 My test subject before Susquehanna arrived was a train led by Metro North GP40FH-2 No. 4900. I was ready. Determined to make this work, I went back again five days later, on November 9. I knew Susquehanna was running earlier, and this time I was determined to get it. I set my camera up on a tripod, adjusted the focus and waited. 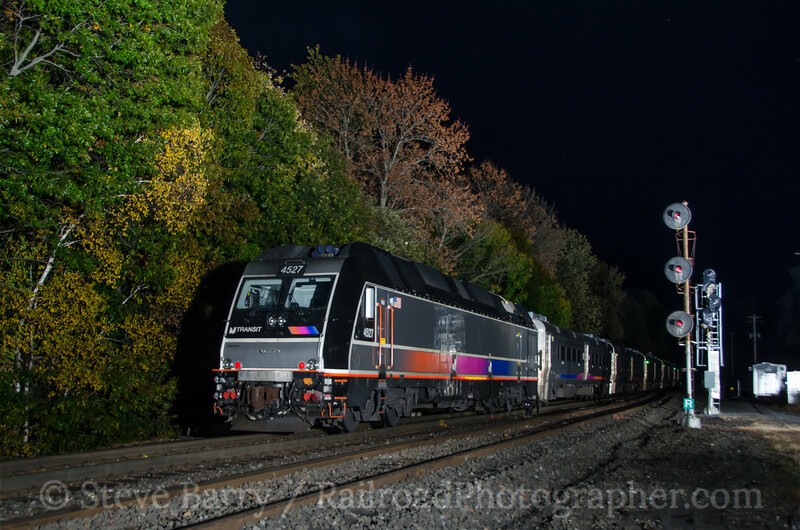 A parade of commuter trains went past my lens, led by NJ Transit GP40PH-2B No. 4206. 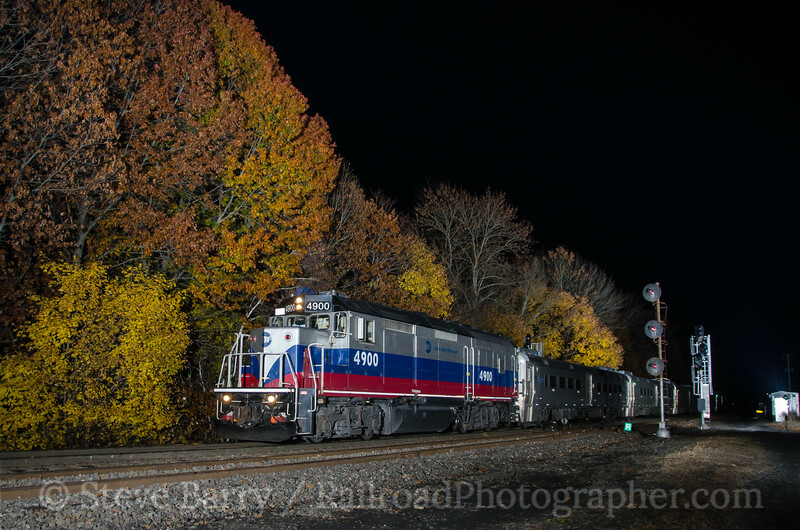 Most of the colorful leaves were gone, but one almost-dead tree was hanging in right near where the locomotives would be for the shot. It was better than nothing... Next up was a westbound behind Metro North F40 No. 4910. The commuter trains run every 30 minutes or so until about 9:00, so I figured Susquehanna would probably not show up until after then. The next commuter train drifted into town just a bit before 9:00 with NJ Transit PL42AC No. 4008 leading. Normally after the 9:00 train the eastbound signal would flip to green in anticipation of the departure of the 9:27 train. The signal stayed red, however... Was there something behind the 4008? Susquehanna, maybe? At 9:20 a headlight appeared from around the curve. Show time.... Camera on, wait for it... And fire! Got it. Finally. The train headed through town with SD60 No. 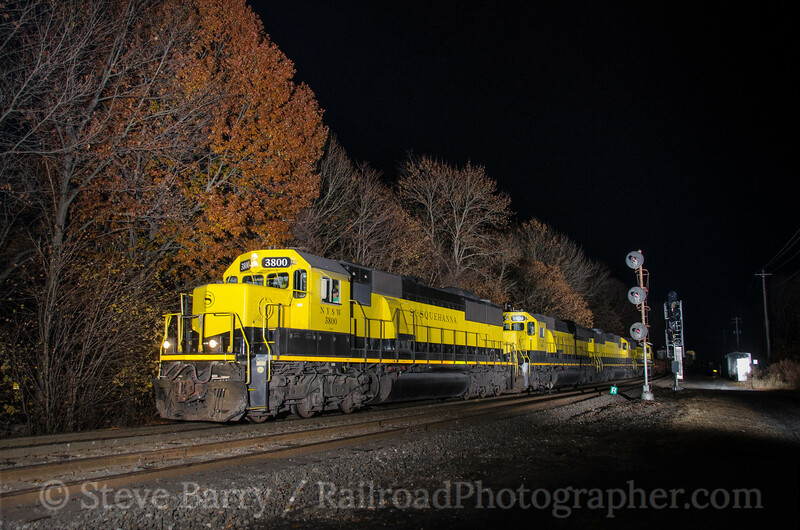 3800 leading a matched consist of four Susquehanna locomotives. It was time to pack up the camera and head back home. Mission accomplished! Photos in this post can be purchased here.